How to get there: The trailhead is located about 15 km (along E-39) north of Skei, or about 4 km south of the village Byrkjelo. The trailhead is correctly marked on the map, in the NE corner of a farmers field, almost straight east from the south end of lake Bergheimsvatnet (138m). You may find parking off the Hwy. near the bridge crossing the creek Gåsemyrelva. Travel time by car from Bergen is about 4 hours. There is accommodation at Skei and likely in Byrkjelo. the hotel at Skei is a large, modern hotel with a nice swimmingpool. They provide friendly service and had no trouble serving us breakfast at 0645, while their official Saturday breakfast time was at 0800. 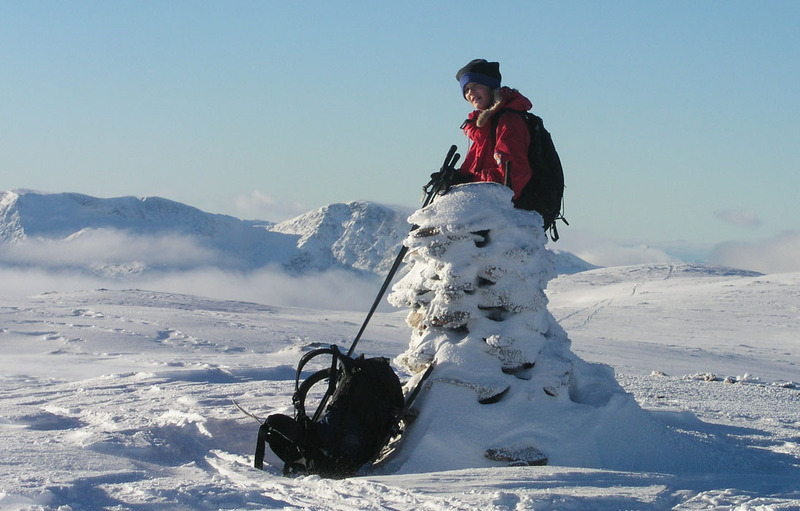 Route description: This description is suitable for a winter climb. 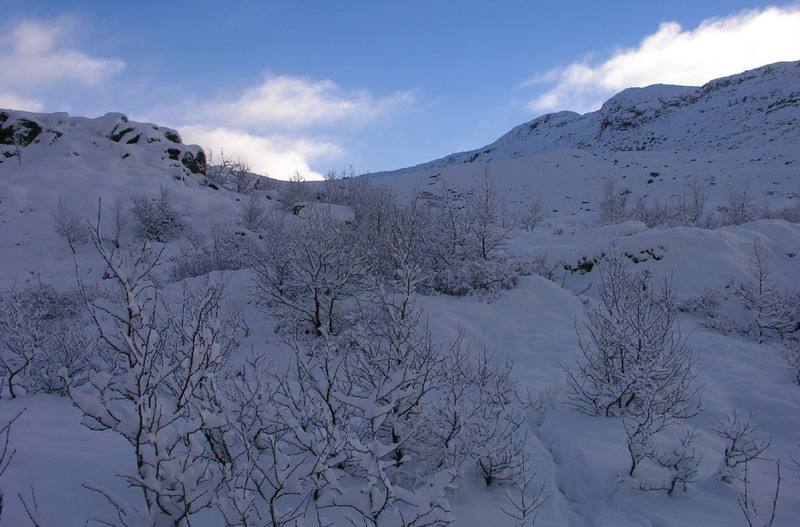 In summer, this route is also quite fine, however, strong hikers may also explore steeper, but slightly more direct variations from Strandastøylen. Locate the gate at the upper corner of the farm field, find a proper access avoiding the field itself in the farming season. This gate is located at elevation 186 meter, north 61:42.085, east 006:32.231. Follow the trail, first a bit northeast, then more parallel to the creek Strandaelva coming down the very steep valley from above. The trail is partly marked with some (pretty old) red "T" painted on trees and rocks, however, do not depend on these, rather follow the steep trail as it zig-zags up the slope. 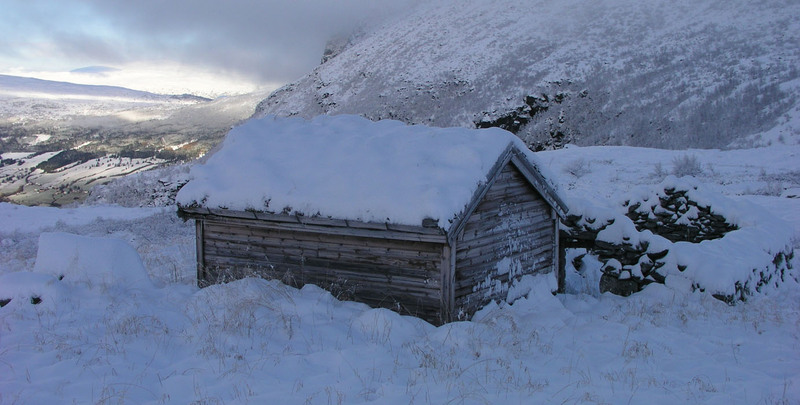 The trail tops out at elevation 824, location N61:41.970, E006:33.194, just west of the small farm cabin Strandastøylen. Continue up the broad bowl heading for a point just south of Hellemerra (1280m). This will provide easy access to the saddle between Hellemerra and Point 1501 to the south-west. 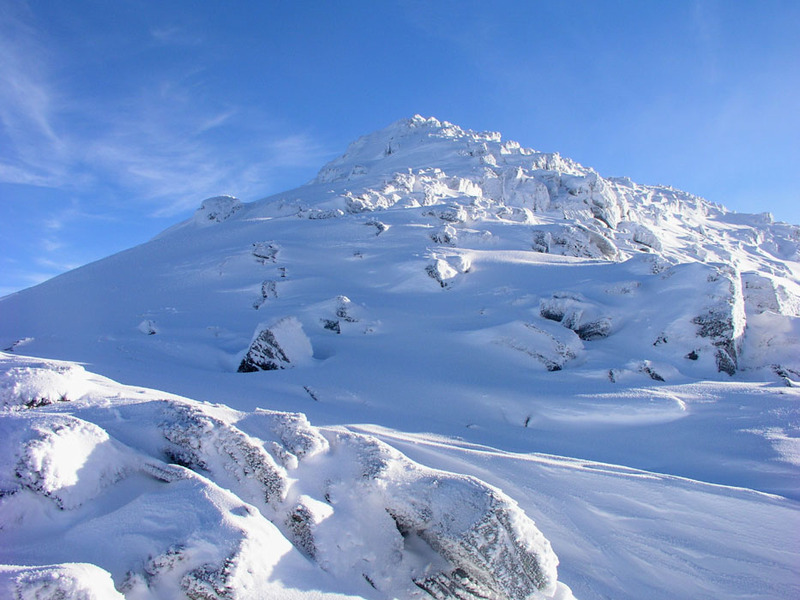 Climb the broad north-east ridge towards Point 1501, avoid the steep part at the very top by traversing right and gain the distinct east ridge at location N61:41.142, E006:34.947, elevation about 1443 meter. Traverse while only slighly gaining elevation, soon you will be on the broad top ridge connecting Point 1501 with the summit. This ridge first heads south gaining a "false summit" at N61:40.670, E006:35.111, elevation 1541 meter, then turning more south-east before reaching the summit. 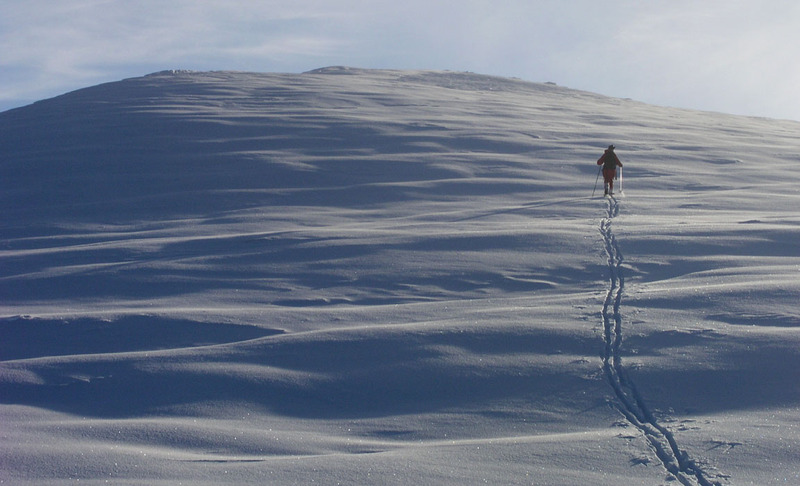 An alternative route, possibly as part of a complete traverse, would be to follow the winding south ridge all the way to Lake Trollebottsvatnet (1066m), then west and steeply north into Øvredalen to complete a "Tour de Storfonn". Note that I have not explored this option. 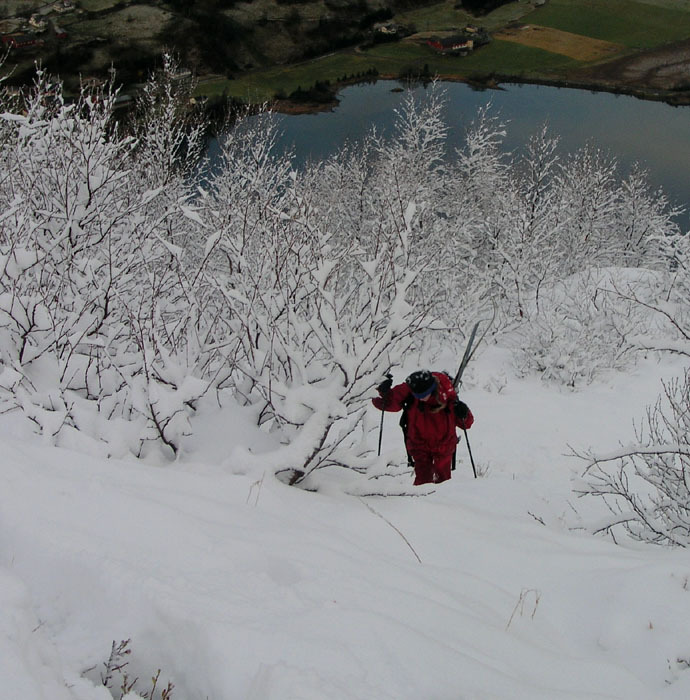 Comments: I did this winter ascent with my son Pål Jørgen, age 15. The weather service predicted a reasonably nice Saturday, with bad weather both Friday and Sunday. Thus, we left Bergen after work on Friday and drove to Skei. We started hiking at 0800. Having parked at Gåsemyr, we made a costly mistake, assuming that the farm tractor road that headed straight up the fields would provide access to the mountain trail. (No good light and a worn map did also contribute.) Unfortunately, this was not the case forcing us to bush walk/climb up trying to merge with the trail higher up. Pretty horrible slope, full of rocks and trees, with a thin layer of slippery snow. We finally connected with the trail at about 600 meter elevation. From here on the snow made it hard to see the trail, however a local deer obviously used the trail frequently thus helped us stay on route. It took us a full 3 hours to top out at 800 meter and start using our skis. The terrain higher up seemed quite rocky, despite a lot of snow we had more trouble with rocks than in most mountains. Most of the snow was fresh from the previous few days and it was hard work breaking trail, knee deep, between and over boulders and rocks. The conditions did not really improve until the top ridge at 1500 meter where the skiing was just fairytale, snow crystals blinking in the sun and a fantastic panorama unfolding. Clouds and fog stayed around in the valleys, the fog even briefly caught us at 1100 meter elevation, but we quickly emerged into blue sky and stable sunshine above 1200 meter. 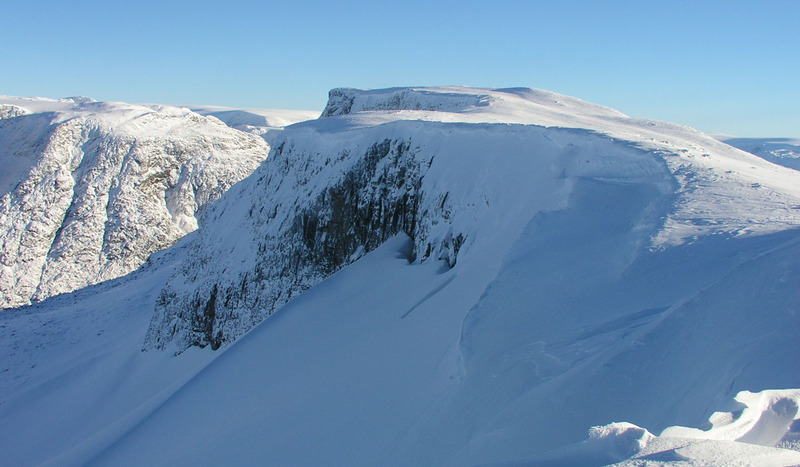 We arrived at the summit at 1400, the cairn is close to the steep cliffs facing Myklebustdalen valley. 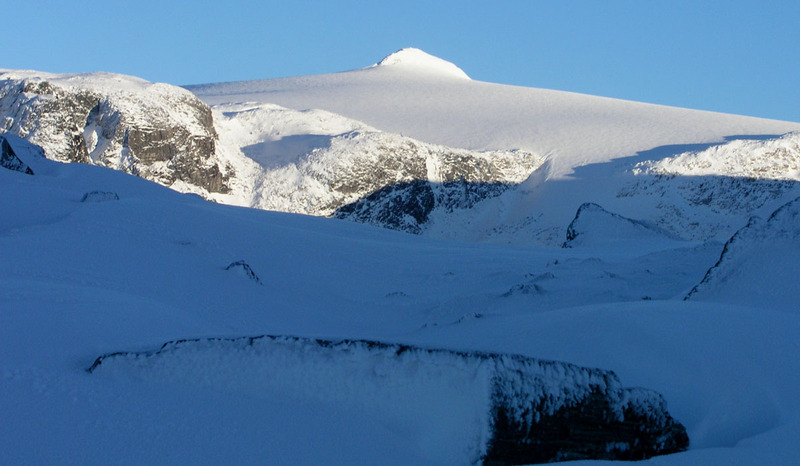 We enjoyed the views, in particular, the Snønipa summit of the Myklebustbreen glacier stood out. We left after about 15 minutes, having spent 6 hours to gain the summit and having only 3 hours of daylight left, reminded us to start the return. 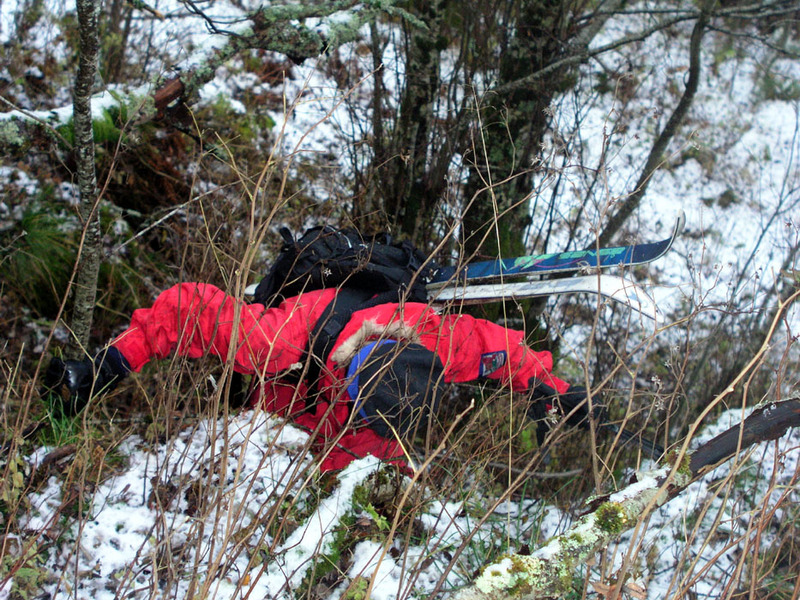 We skied carefully due to all the rocks, many hidden under a thin layer of snow, but unfortunately, Pål Jørgen still fell pretty violently directly on a rock and injured (the lower end of) his back. Hampered by pain, this slowed our descent. We started down on foot from elevation 824 meter at 1600, the steep and slippery trail still took us about 1:45, darkness in a section of spruce forest contributing to further delays. Altogether, about 10 hours of hiking, more than 1400 vertical meter, this trip should only be attempted by experienced parties under November conditions. Storfonn is a mountain that receives few visits, my guess is that only a small handfull will visit this summit in any winter season. Pål Jørgen, fighting his way up. The trail would have saved us at least one hour. Pål Jørgen, completing the first part of the climb. 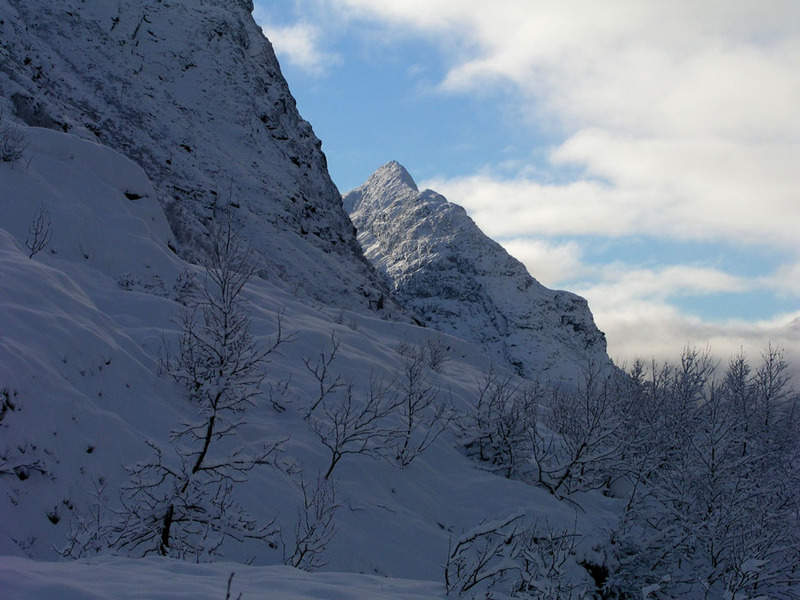 Eggjenibba, 1338m, as seen when climbing Storfonn. 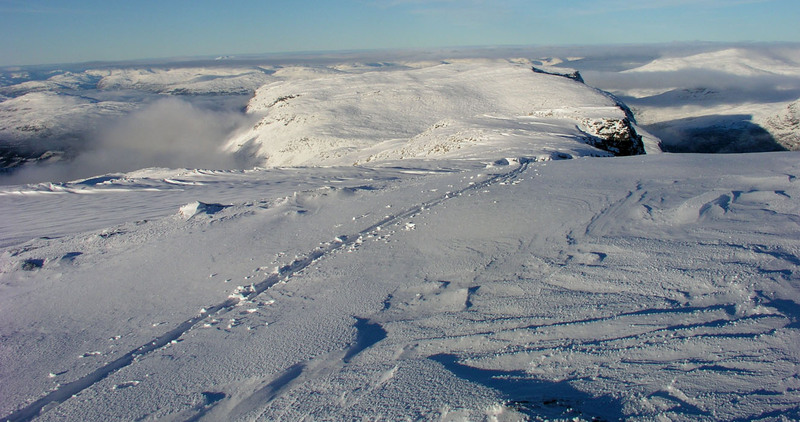 The first part of the skiing route. Point 1501, we traversed below the summit. Snønipa 1827m, our first view. The Storfonn summit comes into view. 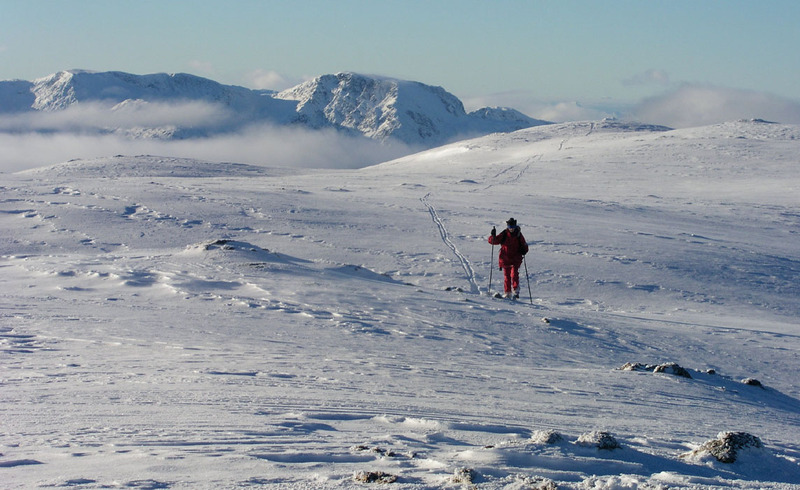 Excellent skiing on the way to the "false summit". 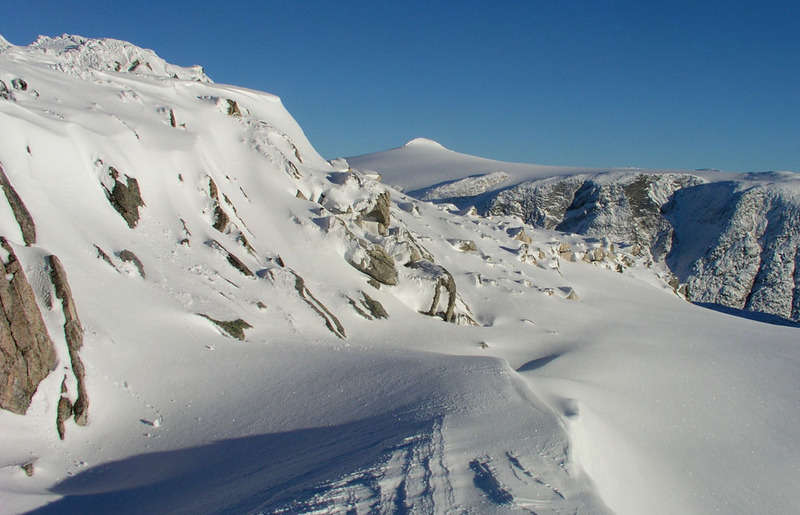 Approaching the summit, Botnafjellet (1572 m), is behind. The summit cairn, Pål Jørgen. Panorama from North to South-East. 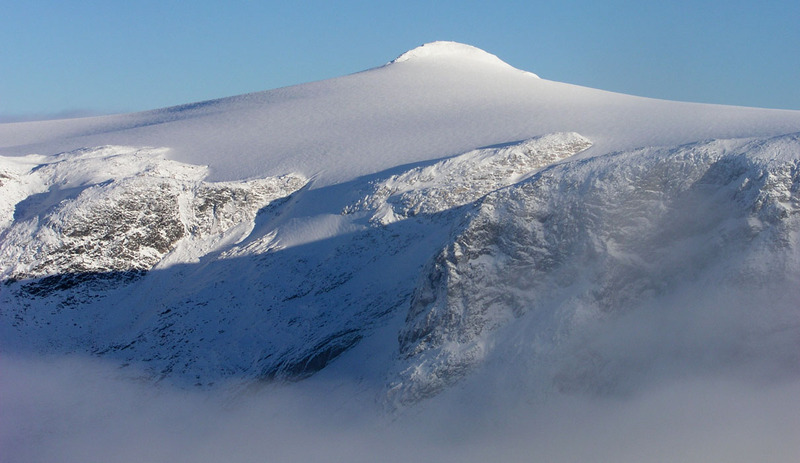 Myklebustbreen with Snønipa 1827 meter, dominates. Panorama continued South-East to South. Panorama West to North, clouds, Botnafjellet (1572m), and Gjegnen (1670m). 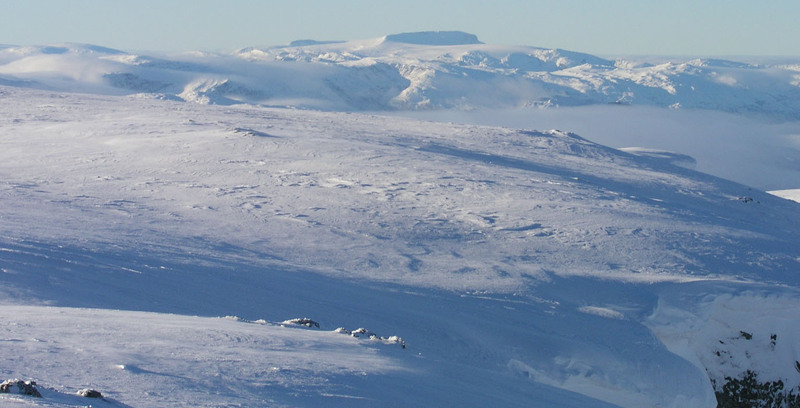 Gjegnen, 1670m as seen from Storfonn. Descent, skiing is still pretty nice. Storfonn landscape, skiing is tricky in places. Snønipa 1827m, our farewell view. Near Strandastøylen, the last sunshine of the day. Strandastøylen on the left, Byrkjelo deep down on the right.